Here’s a nice little voter-generated ad that’s doing the rounds on social networks together. 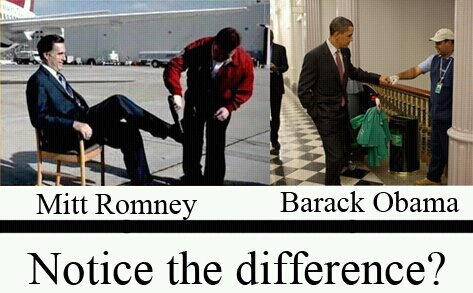 The image highlights the difference between the way in which Obama and Romney treat blue collar / service workers: Romney is pictured getting his shoes shined, whilst Obama gives a cleaner a fist bump. It’s interesting to see that Romney’s personal wealth is quickly becoming a real sweet spot for attack. It seems so un-American to attack someone for business success, but clearly things like the Wall St Crash and the Occupy movement have fundamentally altered the middle ground of politics.